Anyone who knows P. J. Harvey won’t be surprised to follow in this new album the experimentation of such an eclectic artist. Anyone who is interested in WWI will probably be charmed by noting how even contemporary music – and in this case, even alternative rock music, if we need to use a label – does not neglect the topic and finds on the contrary source of inspiration in Great War. 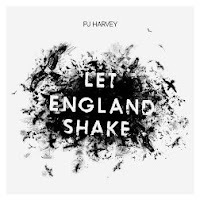 For sure, anyone who loves P. J. Harvey and is fascinated by WWI history will enjoy with her eighth studio album Let England Shake (Island Records, 2011) an unexpected combination of music and history. It is not the case to tell here why and how P. J. started to work at this project in 2008 (hearing about the war in Afghanistan and Iraq) or to describe accurately the different songs, the instrumental experimentation (even a cavalry trumpet and an autoharp) and the lyrics. And it will be also not suitable, to remind how the album took shape – so the Artist – in researching on WWI history and in reading the poetry of T. S. Eliot and H. Pinter. We recall at least the short films which Seamus Murphy made for every track on the album (anyway, further details in PJ homepage), before focusing on the album and pointing out the ancient, suspended, even foggy atmosphere, on the one hand; the precise, finely inlaid design of the narration, on the other hand. It could seem contradictory, yet these two features go together and this is the key we suggest to approach this work. The album talks about conflict, patriotism (not demagogic, but as positive love toward one’s own land), desperation, mutual support, death; references to England and to the Gallipoli campaign in particular are clear in the lyrics. Yet, roaming across centuries and places, there’s no fixed point of view, no rhetorical attitude towards the conflict, and even the WWI as historical setting of the narration, that runs through the different songs, gets sometimes lost in the fog. Following the rhythmical and lyrical fluctuation from track to track, even inside the same song (take for example All and Eveyone or On Battleship Hill) you may feel transported on the battlefield, somewhere, some when, advancing in the sand, no matter if on the Dardanelles frontline or on a more recent frontline. From this point of view, the album creates a rarefied atmosphere which, starting from WWI, depicts the breathtaking and bloody experience of all wars. Yet Harvey’s skill in drawing and painting feelings and situations in rhythm and lyric remains and interweaves this suspended atmosphere: Each single song shows the ancient taste – which is a form of respect – in looking for the “right word”, the most suitable tone (in sounds, words and colors; yes, even colors) to describe the reality, the objectivity of the bodies and the places: physical sensations, fear and exhaustion, the cliffs of Dover, sounds, feet, the scent of Thyme, sand and wind, bones and blades of grass, blood. The suspended atmosphere does not collapse in rhetoric just because well-grounded on this marble triviality of experienced things, of unrepeatable moments and real feeling, on the intersection of voices and glances of those, who walked such days, who walked the Colour of the Earth. We may talk about that still for a long time, without succeeding in giving a satisfactory description of what we mean. So, have a look to the lyrics and then just listen to this album.